Damaturu is a Local Government Area in Yobe State, Nigeria. Its headquarters are in the town of Damaturu, the State capital. The postal code of the area is 620. The Local Government Area has an area of 2,366 km² and a population of 88,014 at the 2006 census. The town of Damaturu is on the A3 highway and has an estimated 2010 population of 44,268. Damaturu is the headquarters of the Damaturu Emirate, at one time part of the Ngazaragamo emirate based in Gaidam. On 16 June 2013, Damaturu was the site of an attack by Boko Haram. Militants attacked a school and killed thirteen people, including students and teachers. On 26 October 2013, suspected Boko Haram militants engaged security forces in a lengthy gun battle and raided a hospital in Damaturu. On 1 December 2014, suspected Boko Haram militants carried out attacks on the city. The assault began shortly after 5:00 am local time. Gunshots and explosions were heard and a base of the riot police was reported to have been set on fire. Yobe state university also came under attack. The northeasterly line of equal latitude and longitude passes through the area including 12°00′00″N 12°00′00″E﻿ / ﻿12.00000°N 12.00000°E﻿ / 12.00000; 12.00000 in the north. ^ "The World Gazetteer". Archived from the original on 2007-10-01. Retrieved 2007-04-04. ^ ISMAIL OMIPIDAN (June 17, 2011). "Boko Haram: how it all started". The Sun (Nigeria). Archived from the original on 2011-08-08. Retrieved 2011-08-03. ^ "Nigeria militants kill school children in Maiduguri". BBC News. 18 June 2013. Retrieved 19 June 2013. ^ "Nigerian militants raid northern city of Damaturu". BBC News. 26 October 2013. Retrieved 23 October 2013. ^ "Nigerian unrest: Damaturu city 'under militant attack'". BBC News. 1 December 2014. 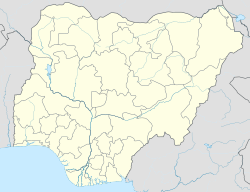 This Yobe State, Nigeria location article is a stub. You can help Wikipedia by expanding it. This page was last edited on 20 June 2018, at 20:56 (UTC).